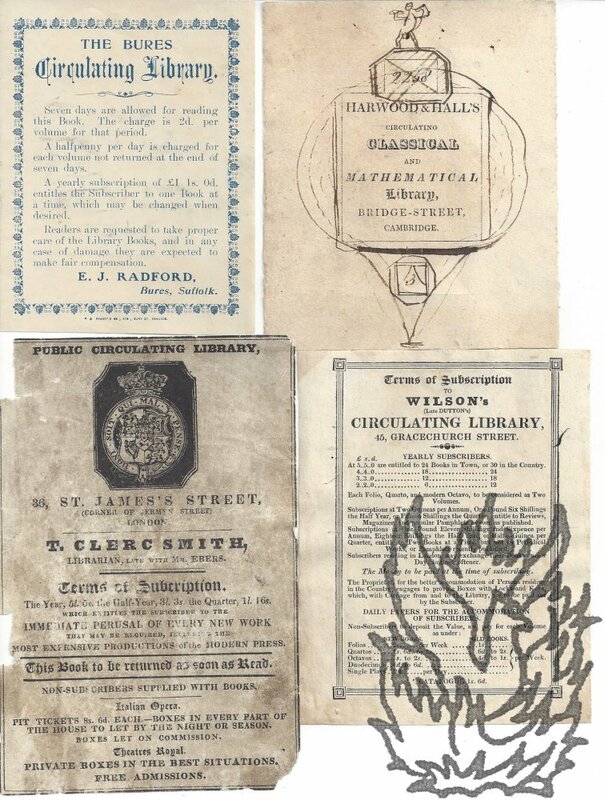 Circulating Library Labels. See scan of all on my website. 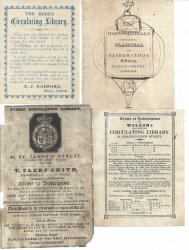 Good-very good condition unless otherwise stated, undated:Wilson's (late Dutton's) Circulating |Library, 46 Gracechurch Street,[City of London] with terms, daily papers, catalogue.T.Clerc Smith (late with Mr. Ebers), Public Circulating Library, 36 St James Street, London, giving terms, c. 9 x 14cm, poor condition.Harwood & Hall's Circulating Classical Library, Bridge Street, Cambridge, no further words though someone has added a cartoon in MS around the words and a number "2258", 9 x 11cm.Goode's Circulating Library (Opposite the Hoop Inn), Bridge Street, Cambridge, offering new publications, printing, stationery, bookbinding, 7 x 9cm.The Bures Circulating Library, giving terms, concluded by name "E.J. Radford", 8 x 10cm, Bury St Edmunds imprint, blue letterpress.H. Neville/H. 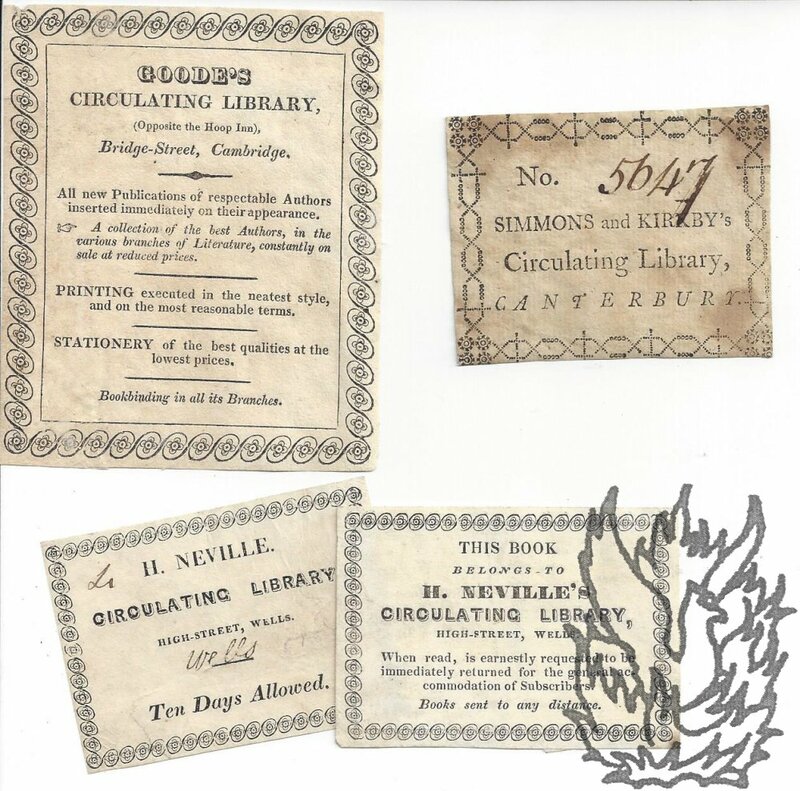 Neville's Circulating Library, High-street, Wells, two items, both c.7 x 4cm, former giving ten day notice only (minor MS adds), the latter requesting immediate return upon reading, and books sent any distance, former has half inch closed tear.Simmons and Kirkby's Circulating Library, Canterbury, foxed but text clear, glue residue on verso,no additional words, but a No. in MS. 5647, c.6 x 5cm.